I’ve been searching for a pair of good quality, truly wireless headphones for a long, long time. They’ve all had one thing or another that’s stopped me from taking the plunge, mainly their flaky connectivity. Today I’m here to say I’ve finally found a fantastic pair. First impressions are important and the very first thing I thought when unboxing the Momentum’s was “very nice looking everything”. I love the case, it’s a gorgeous looking thing with great materials. 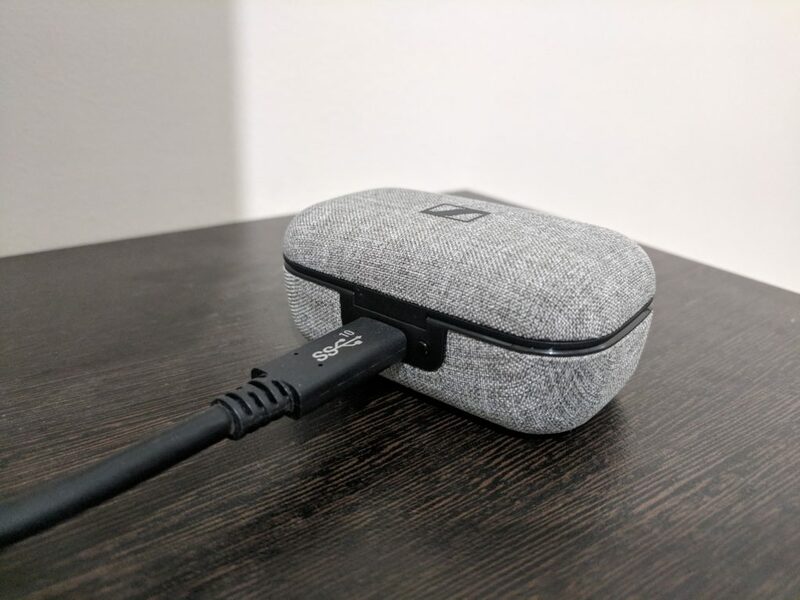 It’s that soft touch cloth like material that you find on the top of Google Home Mini’s. 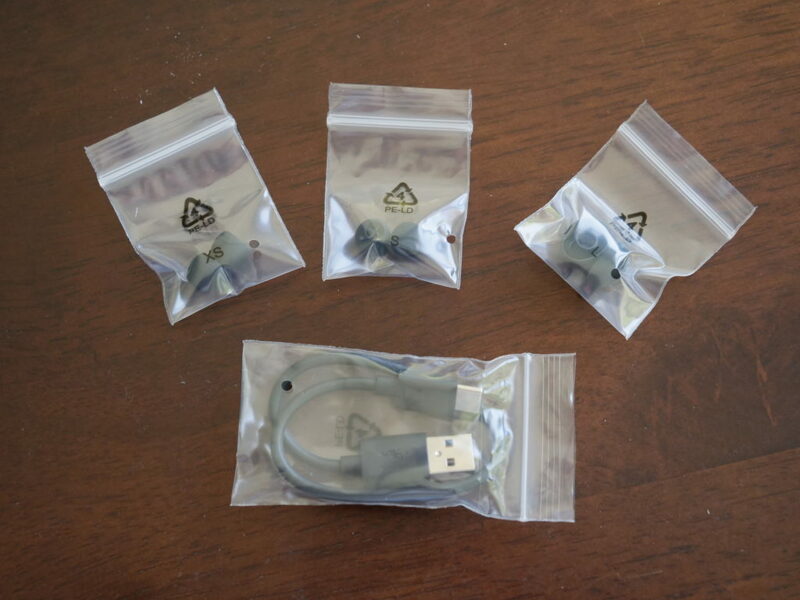 The premium quality didn’t end there either, the earbuds themselves are also great looking too. 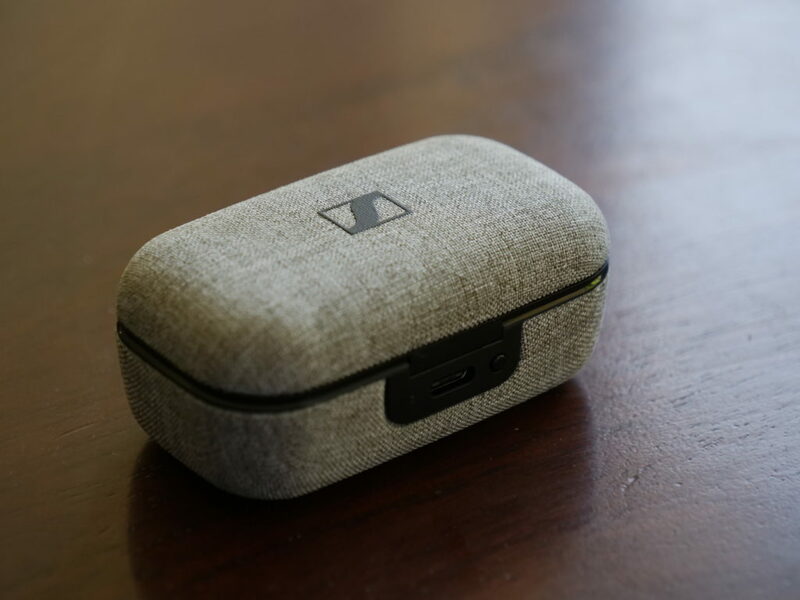 The case also gets an extra special shout out as it charges via USB Type-C, pretty much the only case to do this (Samsung’s Gear IconX is the other if you’re curious). For any manufacturers out there reading this, shoving a microUSB port on your product is now officially unacceptable. Hell, it was unacceptable in 2016! Get with the times and USB Type-C all the things immediately. I was also pleased to see the buds magnetically snap into place in the case super easily and sit well too. What can happen in other earbuds is they “snap in place” but aren’t actually aligned to the charging pins and sit there not charging. There’s also many other cases that don’t have the magnets in them at all meaning the buds can fall out of the case much more easily or are harder to position properly so they charge. 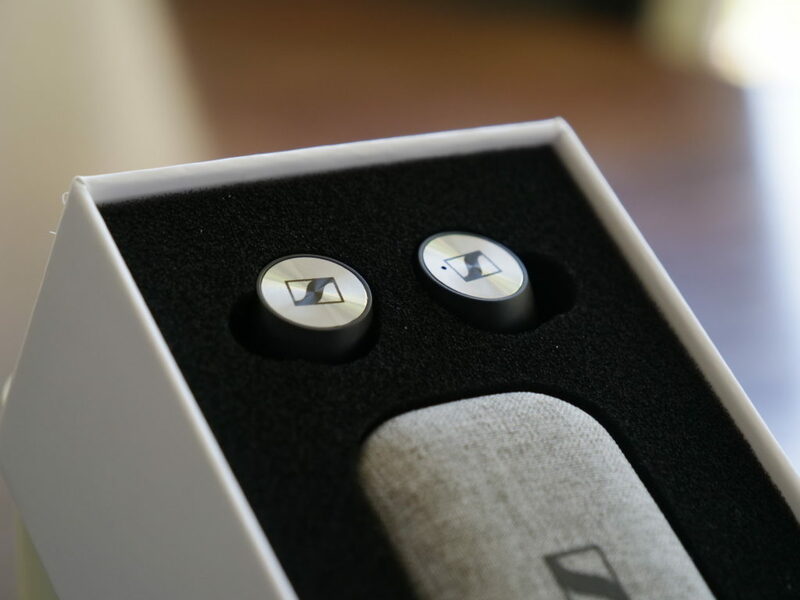 It’s a little touch, but it means you just never have to worry about those problems and Sennheiser has done a fantastic job with it here. Out of the box they went straight into pairing mode automatically, I opened up the Bluetooth settings on my phone, they appeared in the list, I clicked the name once and… everything was paired. I was literally playing music from them in under 15 seconds start to finish. Flawless. 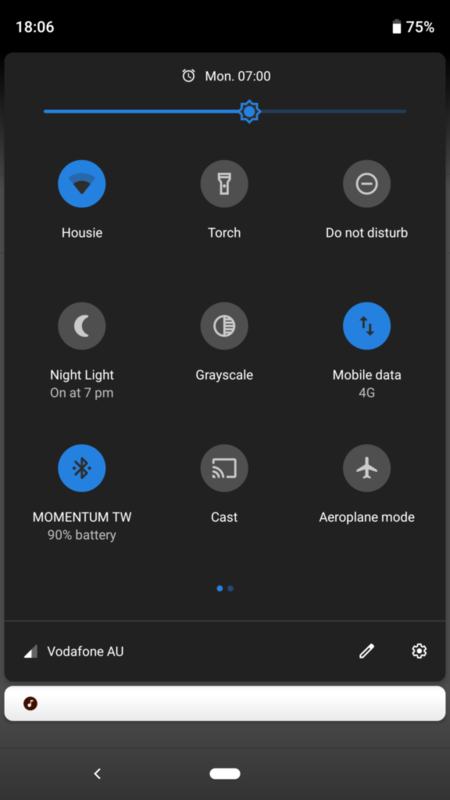 I was also pleased to see that you don’t need to install their app in order to pair them up and it even displays the earbud battery percentage in Android 9.0’s quick settings menu as it should. 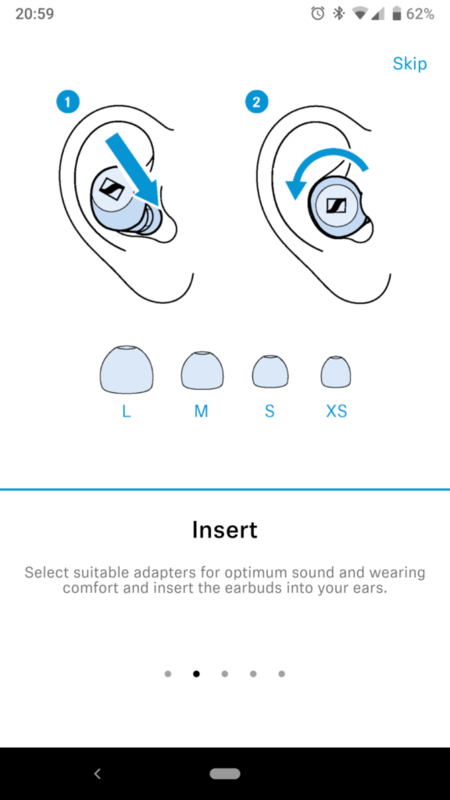 Sennheiser do have a companion app for the Momentums which we’ll get to below, but it’s great it’s not required if you don’t want it. After pairing them up I started to go through a number of songs to see what the sound quality was like. 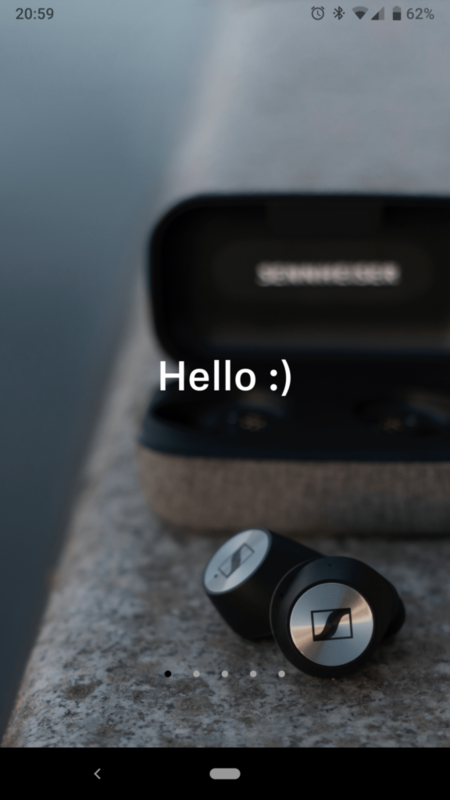 Being Sennheiser, they’re a brand known to have excellent sound quality and they haven’t disappointed here. Cranking them to full volume I tried everything from R&B, to instrumental to Despacito and hard rock such as System Of A Down’s Prison Song. While I’m no audiophile, I do love my music and listen to it near constantly. Even at their full volume, there was no discernable distortion. Even in heavy rock songs that quite frankly hurt your ears I could still hear everything clearly and crisply. This was also another definite thing I noticed which is their very good instrumental and voice/sound isolation. You can hear everything in the audio quite distinctly as opposed to it all being mushed together. All round I was highly impressed with the quality. The touch buttons also perform perfectly and work exactly as I expected them too. There’s a host of commands (4 on each) that are quite logical and easy to use/remember. Your light presses are registered consistently and you can use either a finger or a kind of “hand press” against your head to trigger them. I explicitly wanted a pair with touch buttons on them versus physical buttons as you don’t need to push the touch buttons anywhere near as hard as the physical ones. 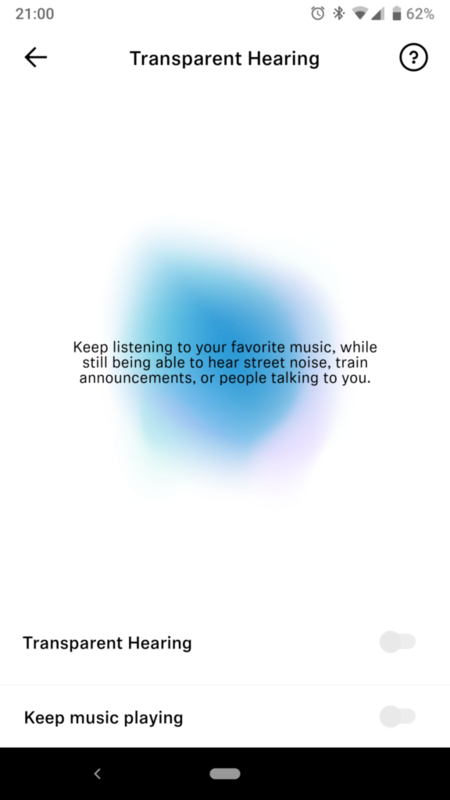 This means that the very light and small buds don’t get crammed into your ear or moved around by you skipping a song. 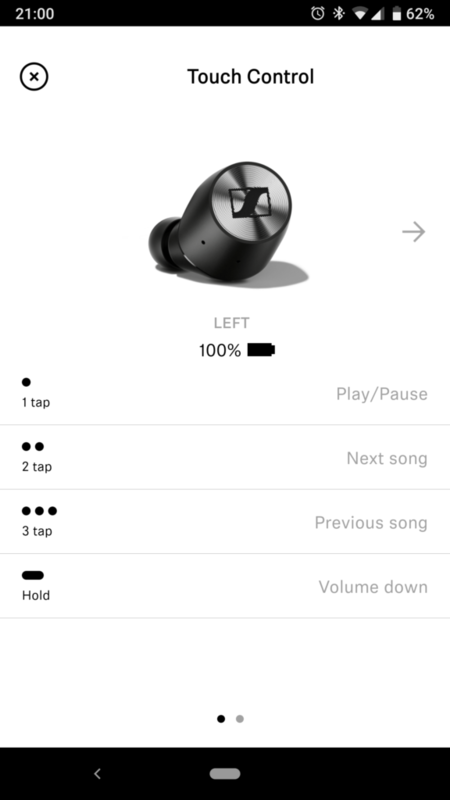 Another major common problem with truly wireless earbuds is their connectivity. As such I was eager to see what they were capable of seeing as it was such a big issue for my previous pair of Crazy Babies. A few quick tests revealed the following. With the phone sitting directly in front of me on the table (~30 cm away) there was zero drops in about 30 minutes of straight listening. Standing ~5 m away from the phone with a clear line of site I also heard zero drop outs. Trying to push it as far as I could, I stood about 9 m away, behind two plaster walls and directly behind a 2.4/5 GHz WiFi router to add a bit of interference. It was only at this point that it started to drop every 15-20 seconds… but I think I can allow for that! Needless to say I was very impressed. Finally the other quick test I wanted to check out was the video/audio lag. Pulling up a quick YouTube video and specifically looking for syncing with the lips there was zero lag and a great experience. So for all of my first impressions, absolutely stellar. Now let’s get a bit more in depth. There is an Extra Small, Small and Large ear tip and the Medium tips are already on the buds themselves. I would have liked to see a slightly longer USB Type-C cable also as this one isn’t the most useful. Being USB Type-C though I already have a bunch scattered around so it wasn’t really a problem for me. As mentioned, the look and feel of the case and buds is top notch. Many of the other truly wireless earbuds I was considering were… let’s say… more basic looking. Ones like the Jaybird Run’s have stellar reviews but don’t exactly look as sleek and premium as the Sennheisers do. The buds themselves have a very nice silver/metal touch button with concentric circles engraved on them. Kind of like the Asus ZenBook line up it’s a very modern and professional look. 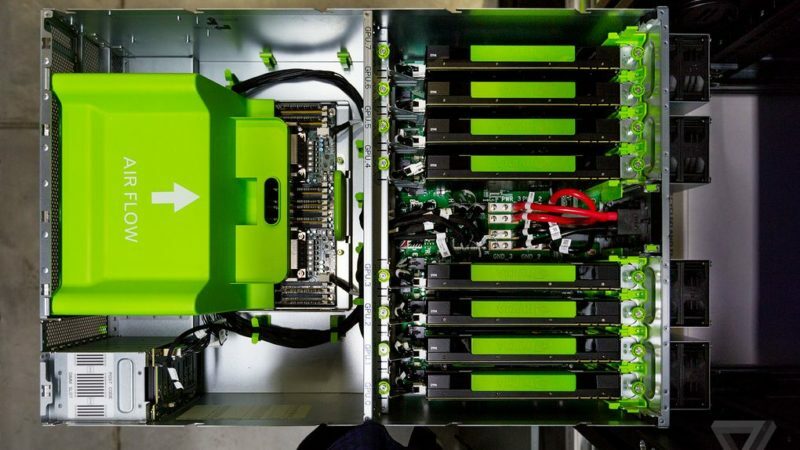 As the buds are magnetically locked into place inside the case they stay firmly inside even if you tip it upside down. At the back of the case where the charging port is there’s also a small button you can press to see the state of the case battery. While the case is plugged in and charging this LED pulses to indicate its status. The lid for the case is also magnetically sealed, so it’s a simple thing to open and close it even though it stays shut nice and tight. Overall it’s a super sleek package however some might find it a bit fat when compared to other competitors like the case for the Earin M-2’s which is more cylindrical and thinner. To put the buds in your ear you simply insert them and give them a slight twist to wedge them into place in your ears. After that they are comfortable and stay in place extremely well. I’ve tried head banging, eating hard, crunchy food, shaking my head to the side violently like you do when you have water stuck in your ears, doing HIIT exercise including jumping jacks, push ups, on the spot running as fast as I can. Nothing I did ever had them falling out. I did have to slightly re-wedge them into my ear once during my work out, but I think this was more a combination of sweat and jumping around. Either way they didn’t fall out, just needed a minor adjustment. Being extremely light you barely even feel them being there and their comfort extends for hours of music listening. You’re going to run out of battery before they start to hurt your ears which is what you want. The original pairing of the buds was flawless as stated. There’s no “enter this code” type stuff here. You just open up the Bluetooth settings, wait 1-2 seconds for the phone to find them, select them and they pair instantly. Done. Bluetooth has come a long way. After they’re paired and you take them out of the case to use they start up and re-pair to your phone very quickly. In fact they do this whole process so quickly that I can’t get them in my ears before they’re ready to go! Measuring how long this is, it’s about 3-4 seconds from the time you take them out of the case to when they’re on and connected. You can also only take one of the buds out and use it just on its own, however from my testing this is only possible with the Right one. It seems this is the master bud and if you leave it in the case and just take the Left one out then it just stays off and nothing happens. 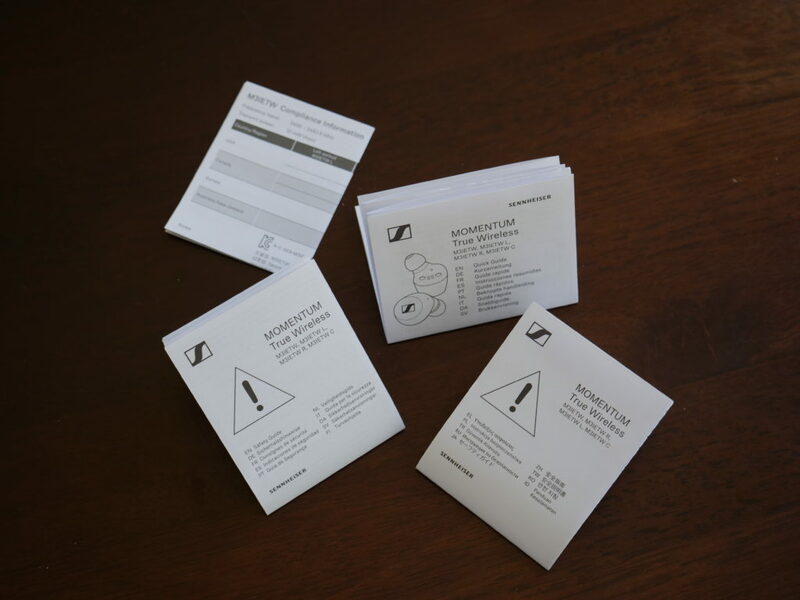 Overall though the Momentums are exceedingly simple to use. They automatically turn on/off when you take them out of the case and put them back in. The setup is super quick as is their startup and connection. It’s just an all round solid experience. Using the touch sensitive buttons on the buds themselves was also exactly what you’d expect and a great experience. They always register your touch consistently, give a pleasant beep to indicate they’ve registered your touch and execute the command promptly. 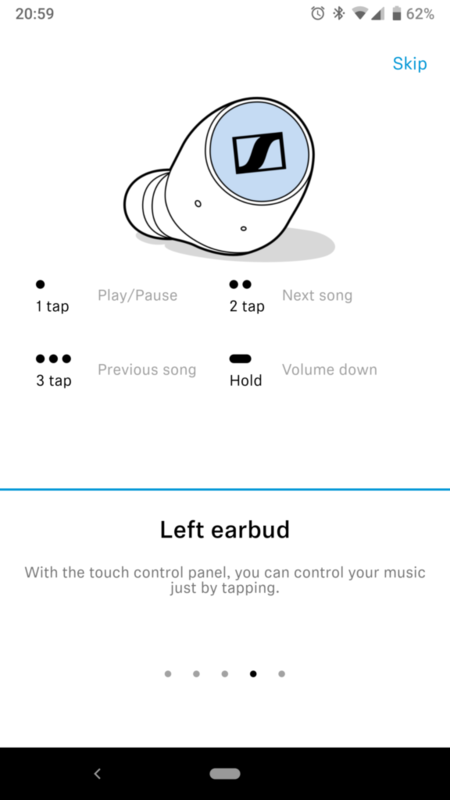 I find touch sensitive buttons are far superior to other wireless earbuds that use physical ones as you don’t end up moving the buds around in your ear while pressing them. Again it’s a small thing, but the slightly more pricey touch buttons completely remove this annoyance and just make the overall experience much more smooth. Above you can see all the instructions for all the buttons, their presses and how to insert the buds themselves. These instructions are in the app as well as the quick start guide. All the button presses/commands make quite logical sense I think and work great as said. 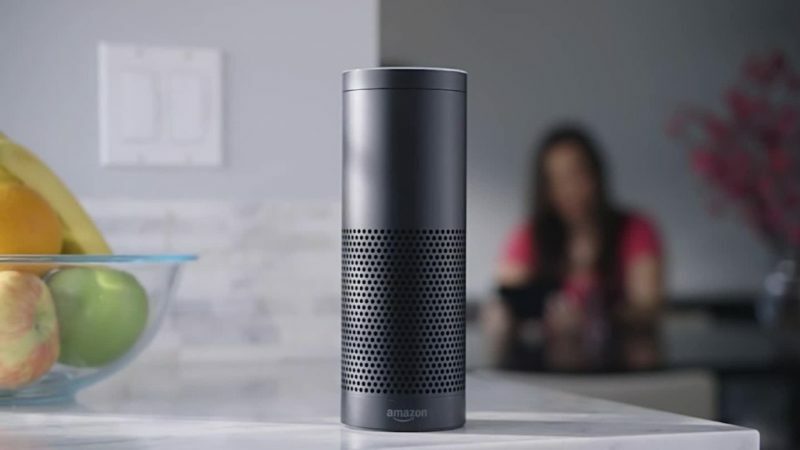 They also give clear, verbal commands when powering on, connecting, ending a call and also to let you know the battery is low. Some other earbuds simply have different coloured lights flashing on them which can be confusing sometimes. I much prefer this verbal feedback. Now for a particularly important part of the review. Connectivity. I’ve been burned heavily in the past with the Crazy Baby Air’s so I wanted to put these new ones through the same progressively difficult tests to really see how good they are. There are many things that affect electromagnetic waves. I actually happen to be uniquely qualified in understanding this as my Science degree was done in Photonics. This degree specialises on electromagnetic waves and their interaction with matter. Bluetooth is an electromagnetic wave. Therefor I fully understand what might interfere with EM waves like Bluetooth radio signals and how they propagate in air right down to a quantum level. 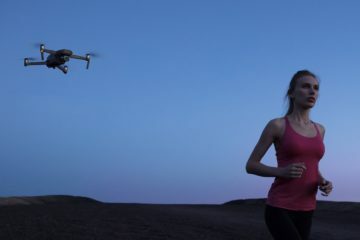 As such I tried to be as scientific and methodical about testing the connectivity as I could. That being said I didn’t exactly have lab equipment or do 100 rounds in a Faraday cage. Whilst this admittedly isn’t as scientific, it is a lot more comparable to real world environments. Our house has a 2.4/5GHz Wi-Fi router in the middle of it. It also has several LIFX Lightbulbs and an August Lock which all operate on the same 2.4 GHz frequency as Bluetooth. While I acknowledge that these could cause interference with the Bluetooth signal this is what happens in the real world. 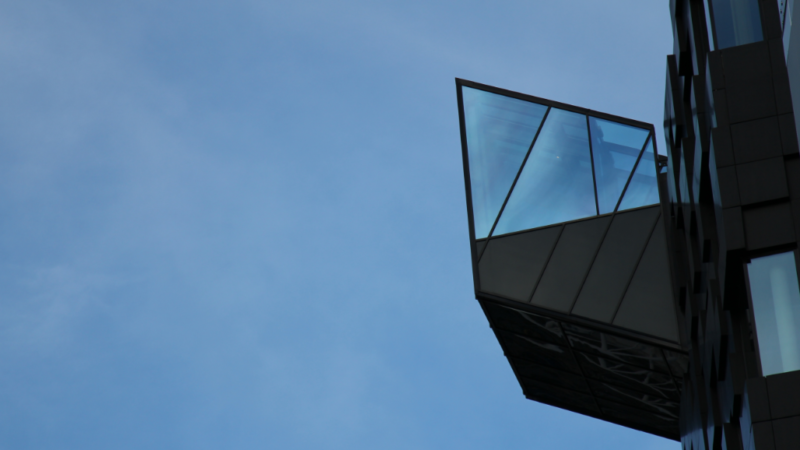 These three environments I believe mimic three very real and very common test case scenarios. All three used the Momentum’s on full charge and paired with a Google Pixel XL that’s running the latest version Android Pie. 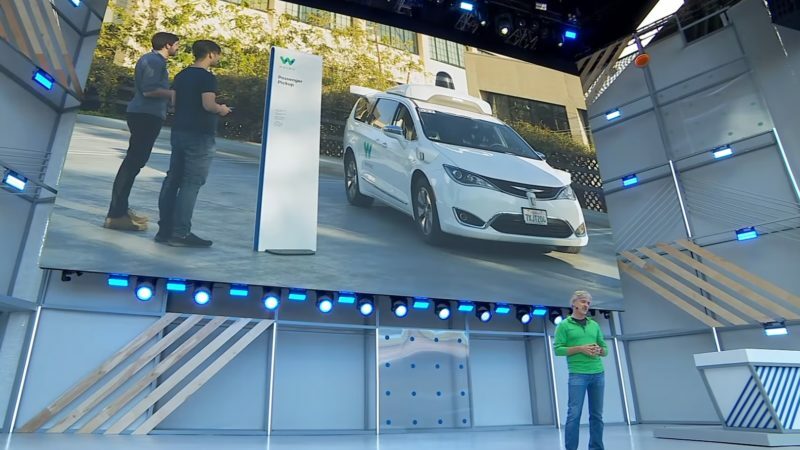 Being a quite common phone the Pixel also has the most stock Android software meaning there shouldn’t be anything software wise interfering with things. The Pixel XL has Bluetooth 4.2 with A2DP, LE, aptX support. To do each test I played 3 random songs via Google Play Music and simply counted the number of drop outs experienced. Repeating this simple first test a number of times in different parts of the house and for not just 3 songs but hours of listening I experienced zero drops. 10/10, complete pass. With the phone in my pants pocket playback was once again free from drop outs. I stood still, walked around the house into different rooms, bent down etc. Everything was all clear and crisp with no drop outs. 10/10, complete pass once again here. The third and final challenge was a weights work out. This involved me placing the phone on the carpet floor around 1-3 meters away from me. I would walk around, load/unload weight plates. Perform free weight exercises while listening to the music. This test case was chosen as it adds a fair bit of interference given it’s now upwards of 3 meters away and needing to pass through weights and steel etc. Going through the session I was once again handily impressed. Not one drop out even when I was positioned so that my body was in between the ear buds and the phone on the floor. I even purposefully put my head behind three barbell weight plates while 4 metres away from the phone to see if that would throw it off. Nope, solid as a rock. 10/10, complete pass. 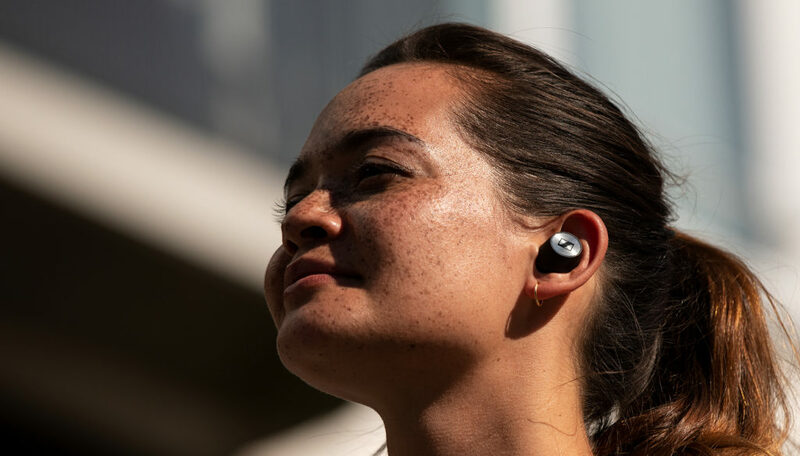 It’s fantastic to see that truly wireless earbud connectivity has now gotten rock solid. They’re still wireless and the laws of physics do still apply in our world unfortunately so you can push them to drop out but we’re talking about pretty stupid use cases. Standing 10 metres away with a plaster wall in between me and the phone and it works fine. 12 metres and 2 plaster walls… you start hearing some drop outs which is fair. Bluetooth 4.2 (my phone) is speced for around 10 metres so it’s quite frankly impressive to see these getting the full spec in real life. I’m also very impressed considering the Pixel XL only has Bluetooth 4.2. 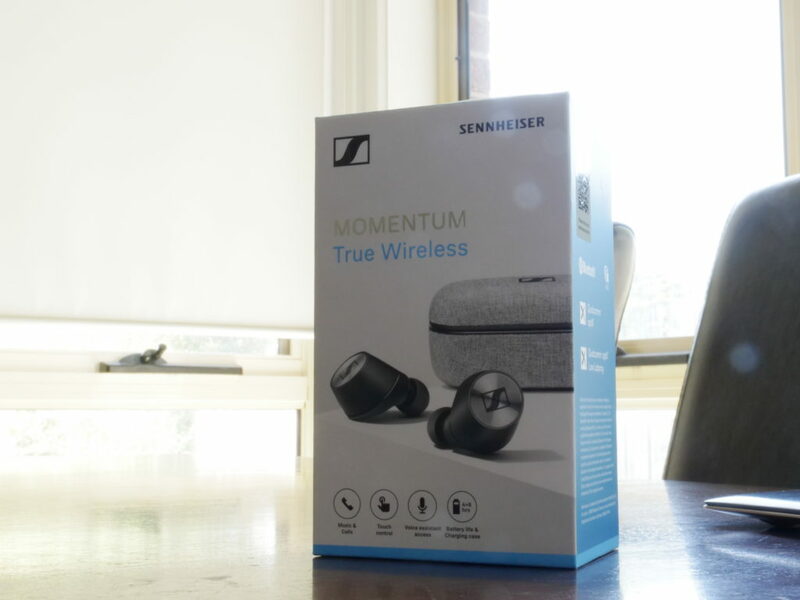 The Sennheiser Momentum’s come with Bluetooth 5.0 which sports double the data transfer speeds, lower power requirements, more robustness to operate in congested environments, longer battery life as well as up to four times the range (40 metres indoor vs 10 metres indoor for Bluetooth 4.2). As such the above tests should indicate an absolute worst case scenario! 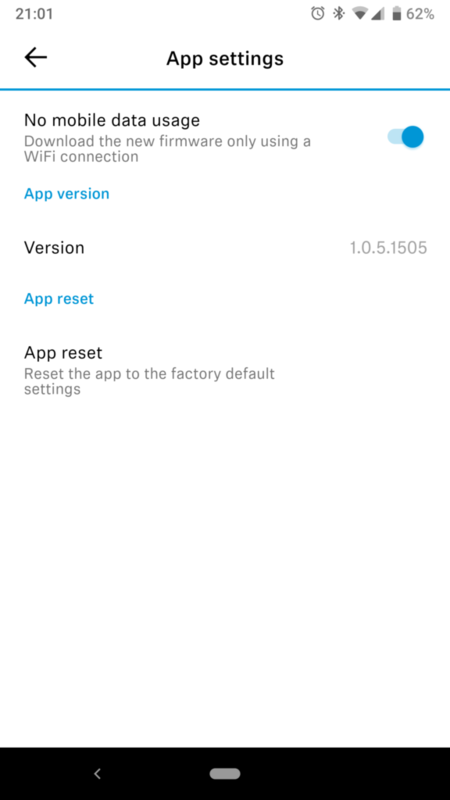 If your phone supports Bluetooth 5.0 (eg. Galaxy S8 or S9, Pixel 2 or 3, OnePlus 6 etc) I’d expect even better range and robustness which is fantastic. USB Type-C. What everything should have in 2016, 2017, 2018 and 2019. No excuses people! 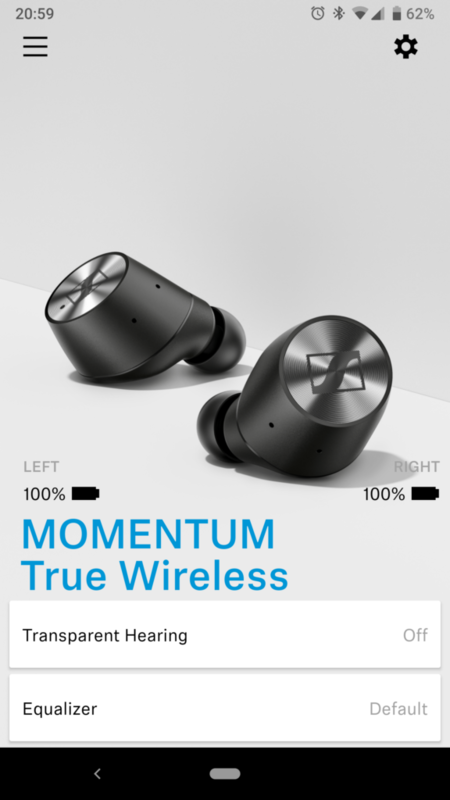 According to the specs the Momentum True Wireless earbuds have 4 hours of battery in the buds and then another 8 hours (ie two top ups) in the charging case itself. After 3 hours and 45 minutes of listening to music at 70% volume and the phone around 50 cm away from me on the table they finally died. Half way through the test I was seeing battery levels of 50% (right bud) and 75% (left bud) in the Sennheiser app. As mentioned, the right bud is the “master” which explains why it drains it’s battery quicker than the left. However given the left one can’t function without the right one being on it means that it having 75% of battery left (whilst impressive) is kind of useless. Overall battery life is pretty good and what was about expected. I didn’t get their quoted 4 hours but maybe if you have volume at 50% and less interference in your house you might see that figure. 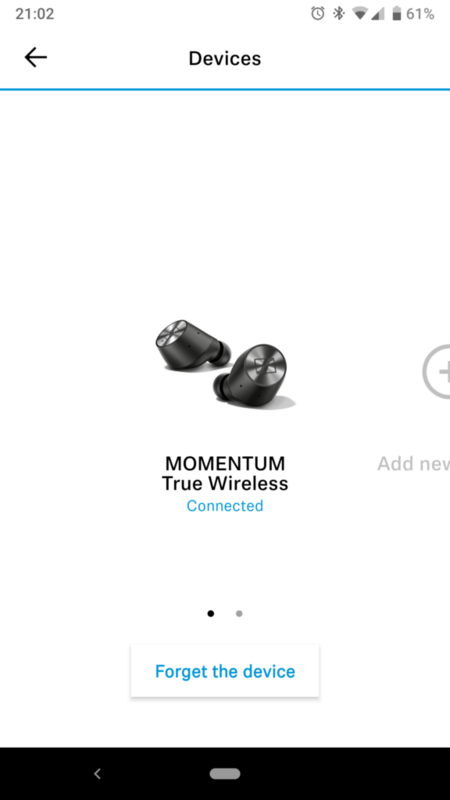 While 3 hours and 45 minutes is plenty long enough for me, the Momentum’s are of a decent size and yet still get outdone by other cheaper wireless earbuds such as the Jabra Elite 65t’s which have 5 hours of charge or the Earin M-2’s which are far, far smaller and yet still have the same 4 hours. I think for 99% of people it’s not going to be a problem given real world, legit playback of 3.75 hours is quite a long time especially considering you can charge them up another two times over with the case. That being said there are other products that offer longer battery life so if you’re someone who flies often and wants to listen to music for hours and hours and hours, maybe consider another pair.. or just use wired headphones! 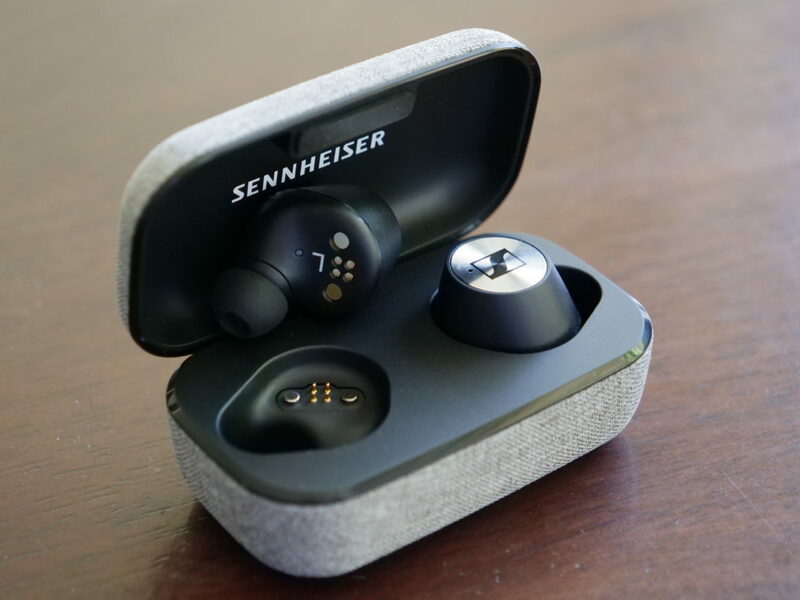 Given their size and moderate battery life one can only assume that the space inside the buds is mostly taken up by bigger and beefier speakers than you might otherwise find. The sound from these earbuds is crisp, loud, distortion free and frankly a pleasure to listen to. 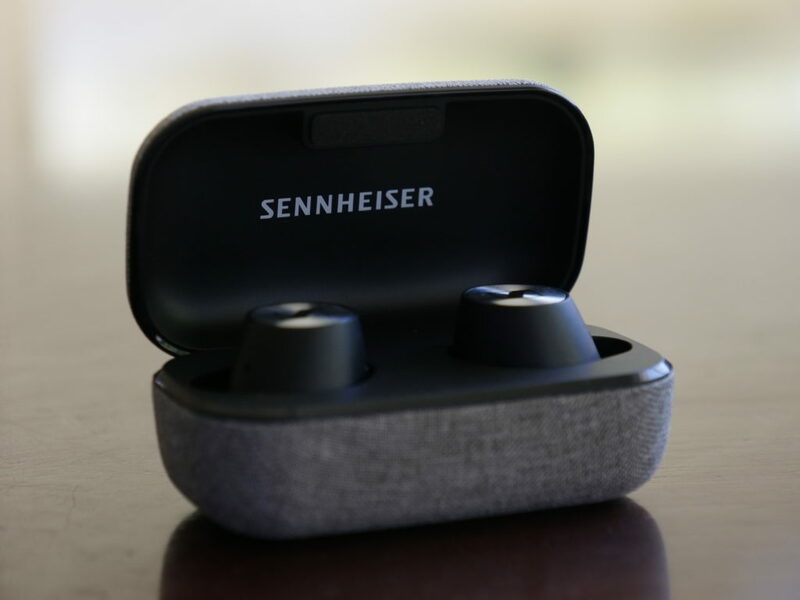 You can easily hear specific sound separation and that clarity and distortion free experience really helps to put a reason behind their quite high price tag. 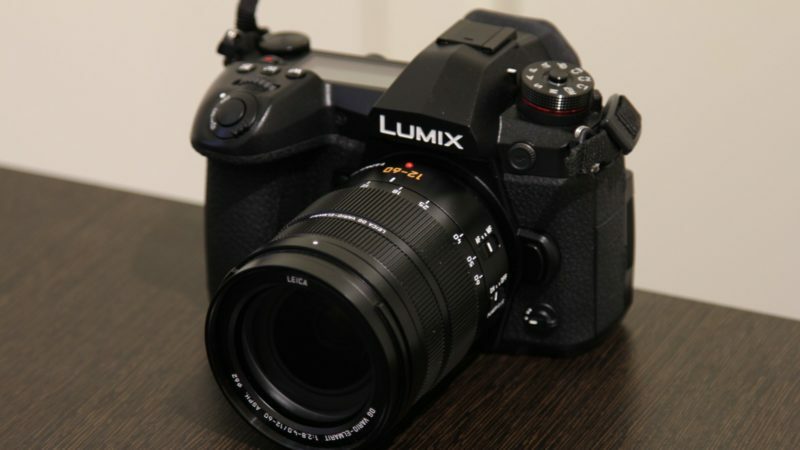 Coming in at $500 AUD or $300 USD these puppies are pretty much the most expensive ones you can get. Quite often with high priced items you can still get sub par experiences or just sub-par components – I’m looking at you Apple! This isn’t the case with the Momentum’s. It’s clear they’ve put a good deal of effort into the sound experience as well as the physical hardware itself. 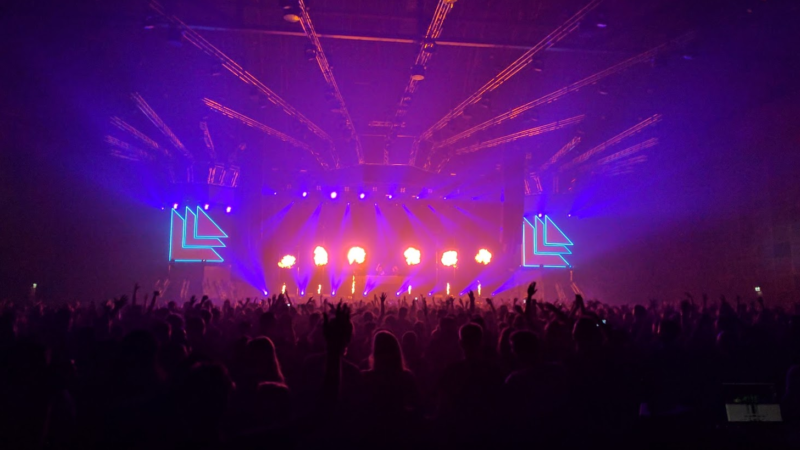 Even when cranking them to full volume, with the equaliser set to heavy bass, with a heavy bass song it’s distortion free, painfully loud and sounds great. Speaking of bass, they push through some very solid bass sounds considering their tiny size. At the same time you can still hear both the mids and highs very clearly and separately. All round it’s a fantastic listening experience and highly recommended. Lastly the calling experience can be described as acceptable, but not overly amazing. The receiving callers experience while on the phone with me was described as “fine, but did sound like I was on a headset“. Going through various tests such as talking whilst running a kitchen tap at full power, running a large desk fan at full power and looking directly into it about 1 metre away or just generally walking around and talking all yielded obvious noise interference, but the receiver could still easily understand me in all scenarios even though I was just talking at a normal level. 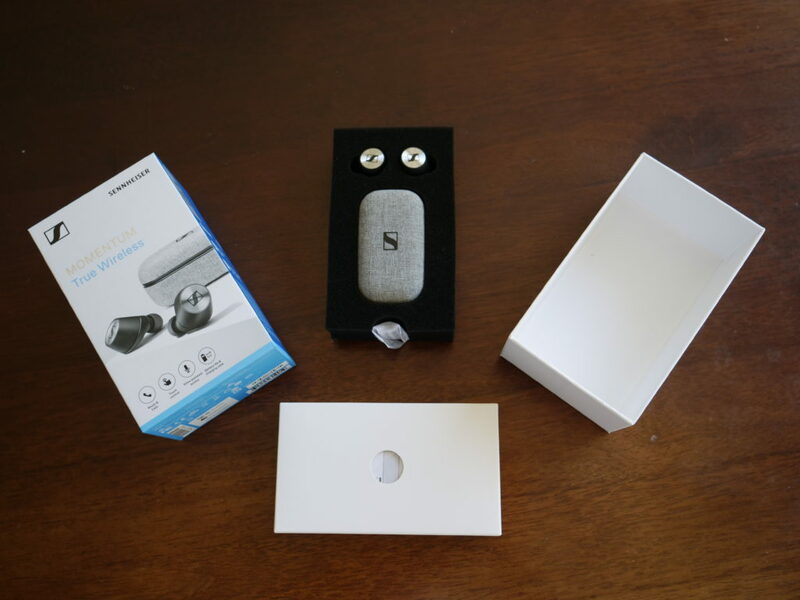 Each of the earbuds have two microphones – so four in total – however the noise cancellation doesn’t really seem to function too well. You will still be heard easily by the other party, just be aware that ambient noise will translate through the call along with you. Maybe Sennheiser will push out a software update to fix this up a bit more but I don’t consider it a huge problem given the other party can still hear you clearly which is always the main priority. Their companion app is available for both Android and iOS and at least on the Android side a perfectly acceptable and good experience. The app is well presented, has excellent iconography and is in line with Android’s Material Design aesthetic which is nice to see. It works flawlessly on Android 9 Pie on the Pixel XL with smooth animations and clear explanations for everything. 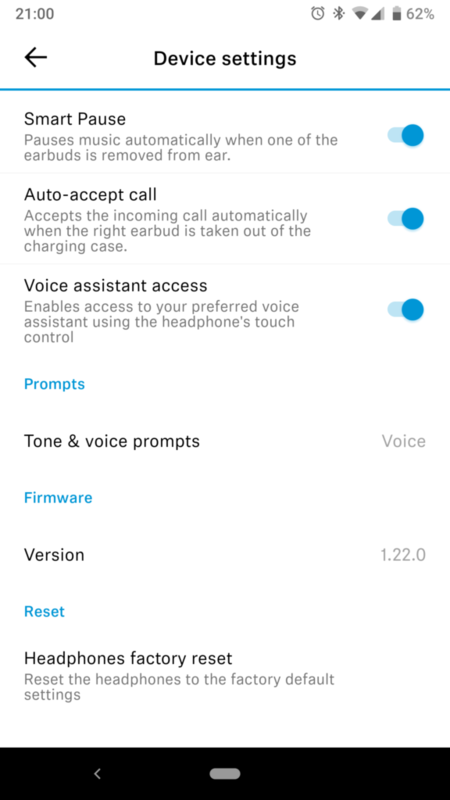 You can add and manage multiple headphones, access app wide or headphone specific settings via various menus and the introduction wizard is sleek and informative. Connection to the earbuds was quick and always worked. Once connected you can see the buds individual battery life, turn Transparent Hearing on or off as well as adjust the Equaliser. 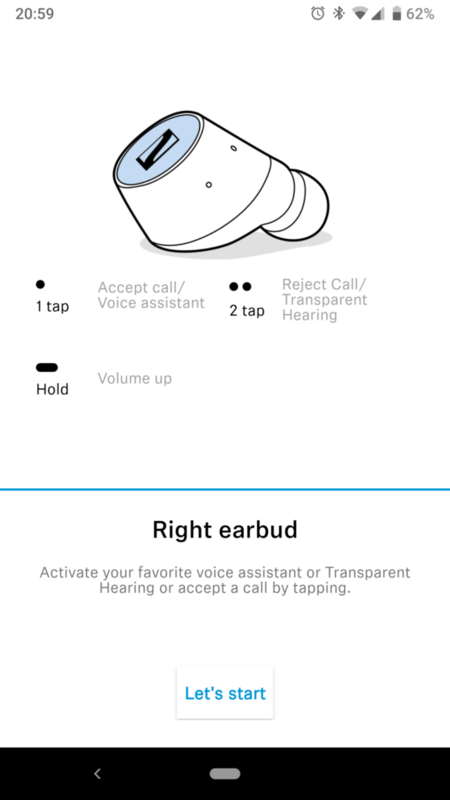 There are also options to turn on/off smart pause (which pauses music automatically when you take one of the earbuds out of your ears), auto-accept calls and also voice assistant access. 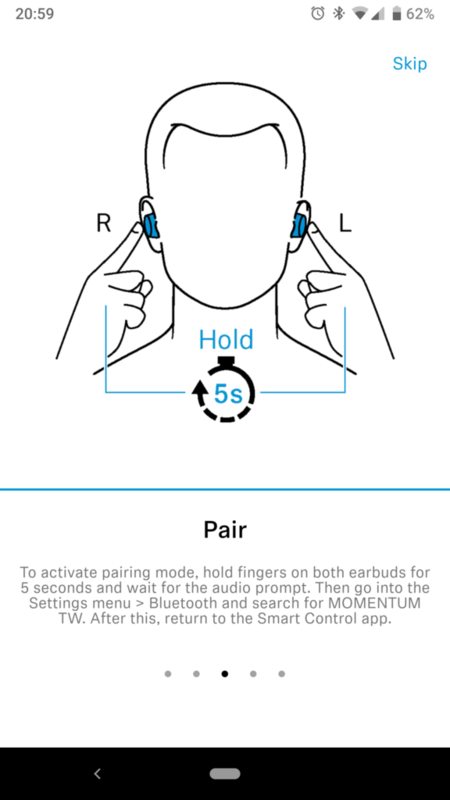 I think a good update for the app would be to allow for you to edit the earbud touch controls. Maybe you prefer tapping the left earbud once to go forward a track rather than having that particular control pause the song. Being able to reassign the commands would be quite handy especially if it supported other phone functions like say tapping 4 times to have it call a certain person or maybe take a photo. That way you could use them as a kind of remote shutter. Speaking of these types of potential future updates, there’s even a handy toggle to turn on/off mobile updates which is appreciated. Overall though the app does exceedingly well and I’ve had no issues at all with it. One final note is that when starting up for the first time the app asks for you to enable “Location Services” Permissions. While this might sound a bit weird – why does a headphone app need my location???? – it’s actually a quirk of Android. Since Android OS 6.0 (Marshmallow) Google changed its permission requirements. 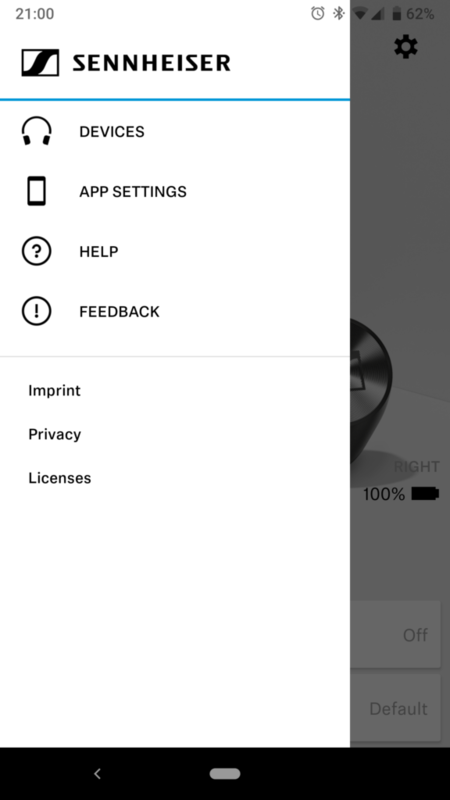 As such the app needs the Locations Services option on your phone to be turned on in order to perform Bluetooth low energy scans. 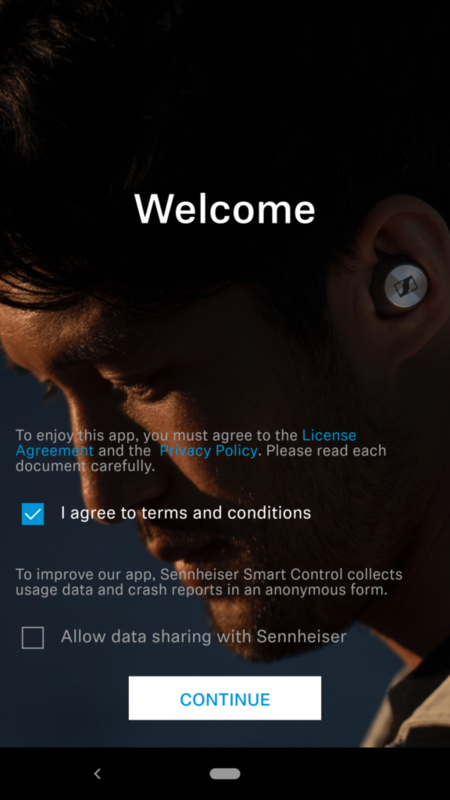 While I can’t be 100% sure Sennheiser isn’t also using this permission to track you, it is actually a legitimately needed permission request as otherwise they wouldn’t be able to find the buds. You can see all the various parts of the app in the bellow gallery. 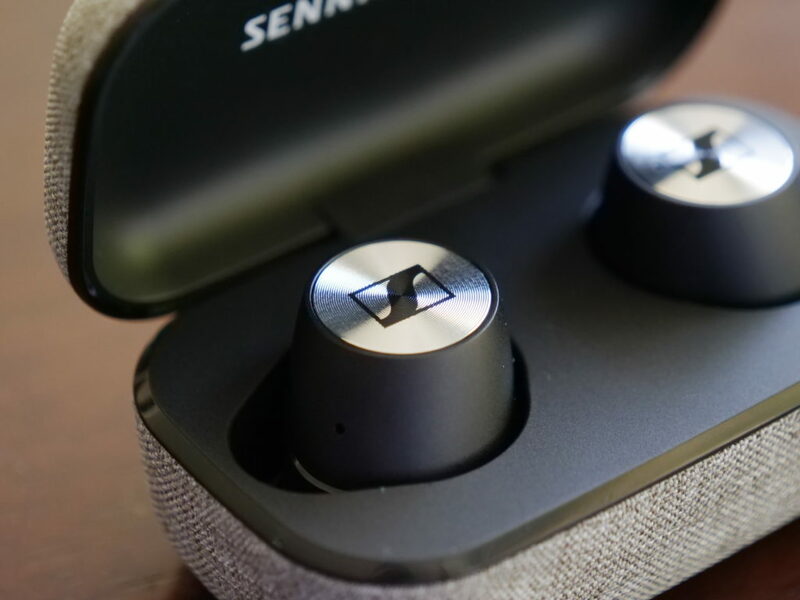 Overall the Sennheiser Momentum True Wireless earbuds do a job on par with their price tag. That is to say top notch. I’ve docked them one point with their included components as I think the USB Type-C cable should be a bit bigger (eg. 1 metre). The battery life also could be better given the physical size of the earbuds but it’s still quite adequate and good. The companion app works excellently, however doesn’t have a particularly big range of functions. 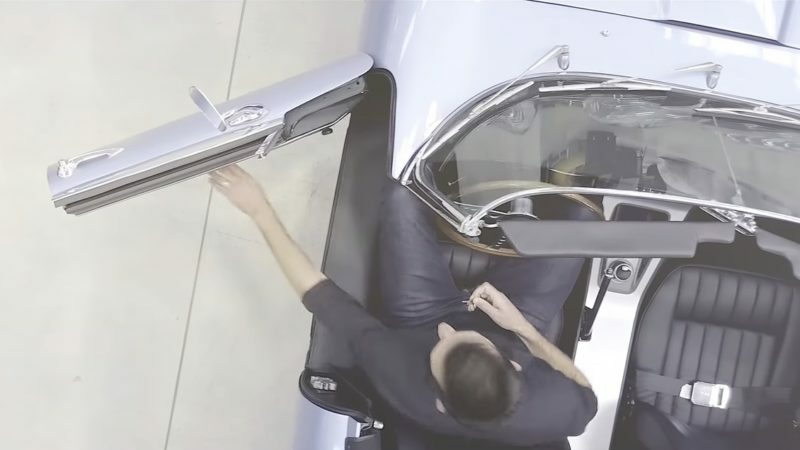 As mentioned I’d like to see more configuration capabilities. 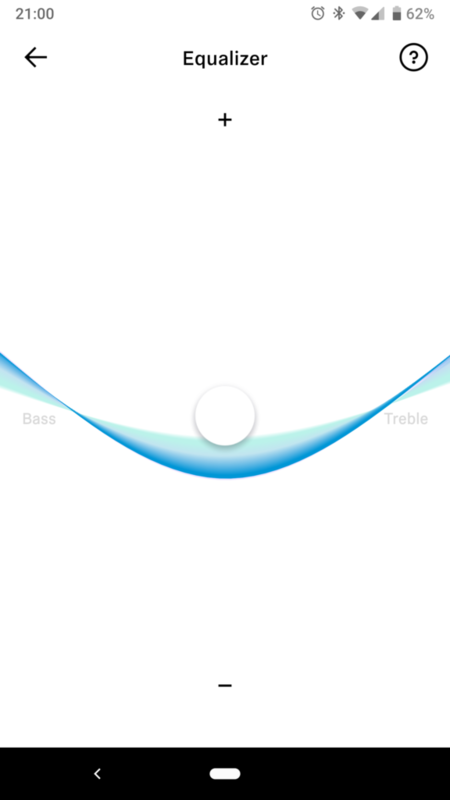 Things like remapping touch controls, maybe some equaliser presets or even a “find my earbuds” type capability. 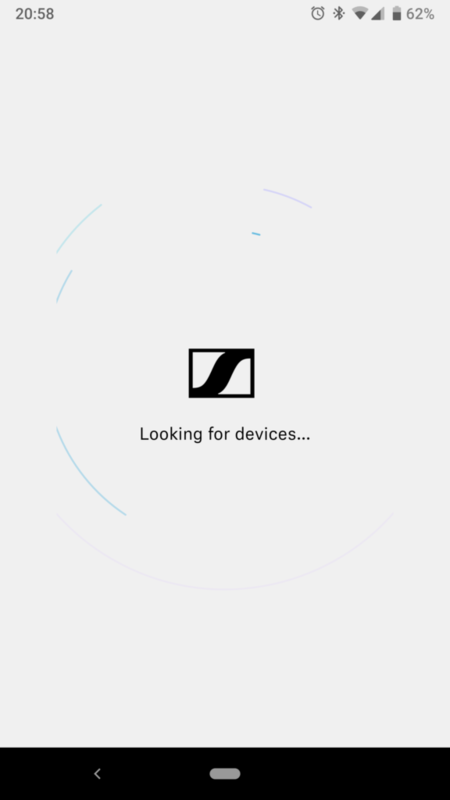 Hopefully Sennheiser continues to release software updates but even if they don’t their score is pretty much maxed out on everything. At $500 AUD I can’t look over the fact that the asking price is pretty damn high. These are not your cheap toy! With that super premium price tag though comes a certain expectation that they’ll basically be 100%, no compromises perfect. However I can honestly say that they well and truly live up to that expectation. Their connection is absolutely rock solid. 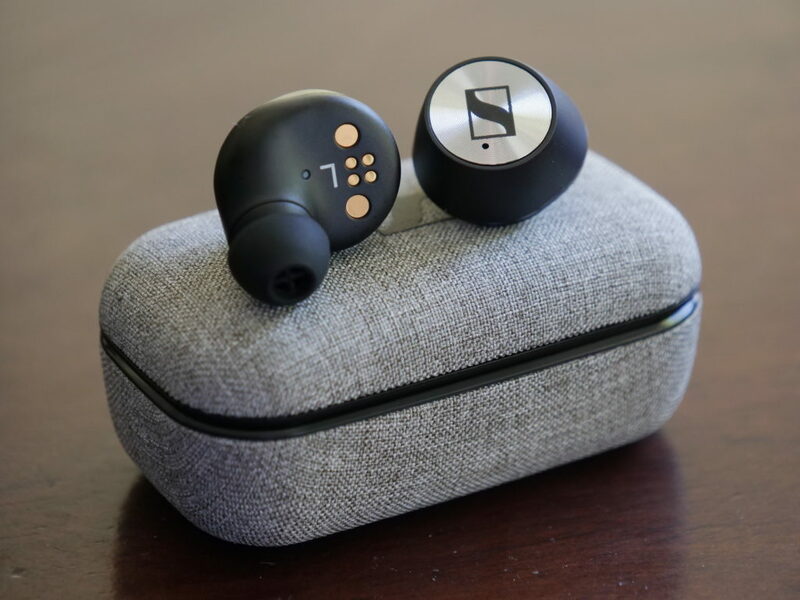 Their sound quality is the best I’ve ever heard in truly wireless earbuds. 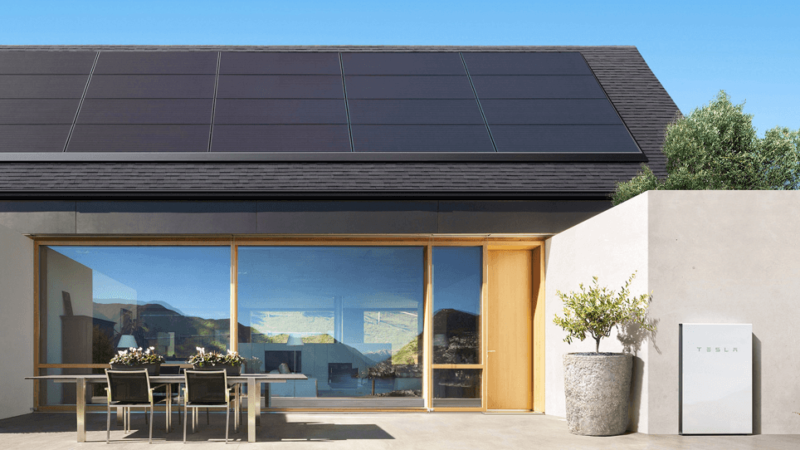 Their ease of use, feature set, battery life, quality materials and design is also all near perfect. 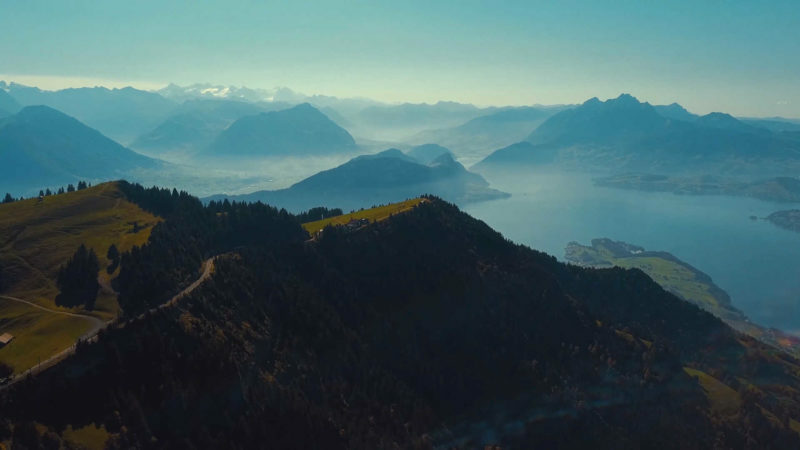 The other thing to appreciate here is that this is Sennheisers first attempt! With that attempt they’ve managed to hit the ball well and truly out of the park and if you can scrape the money together you certainly won’t be disappointed. 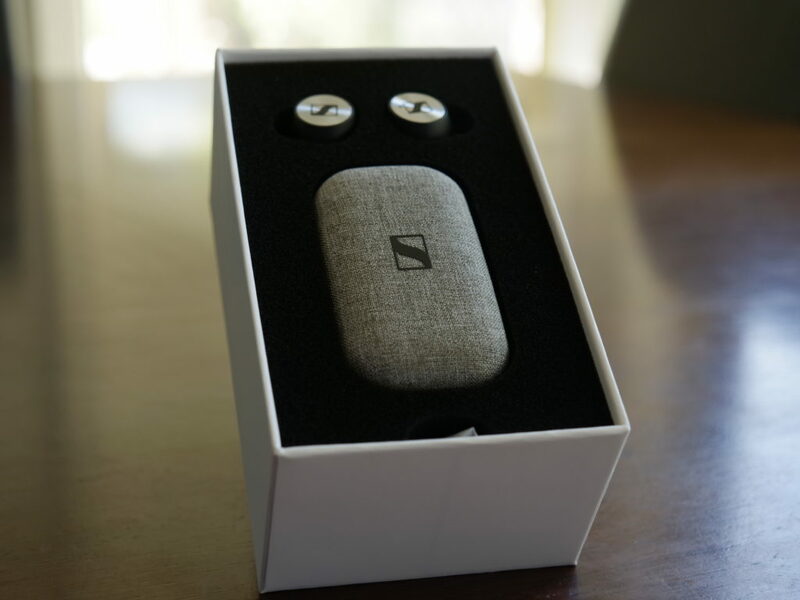 Sennheiser, if you’re reading this you’ve done a wonderful job and thank you for this product. 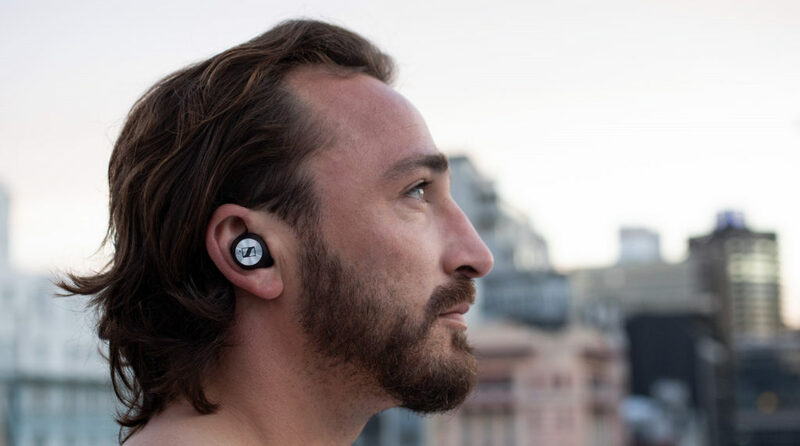 Now go and give the team that designed and built these earbuds a raise and promotion!